Struggling to decide between a build-it-yourself cloud data warehouse or a turnkey solution? This is the only tool you will need to make that decision quick and painless. 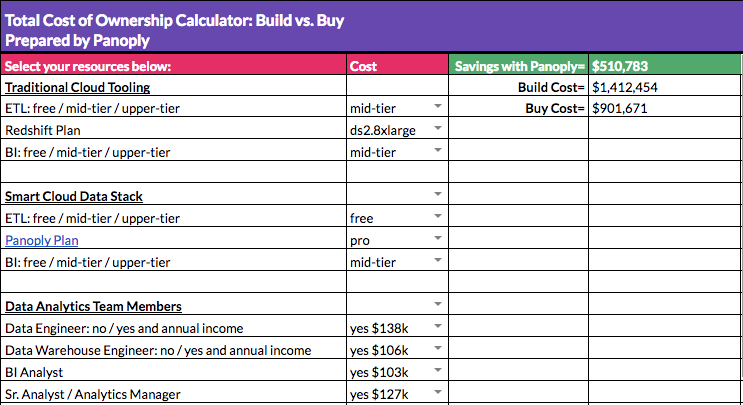 This powerfully simple calculator quantifies your expected investment for data warehousing. We’re giving this away totally free, because there’s no time to waste in creating a state of the art data warehouse system. Demystify the data warehouse selection process and move forward. Download your calculator now, and see which data warehouse will generate the most return for your business.